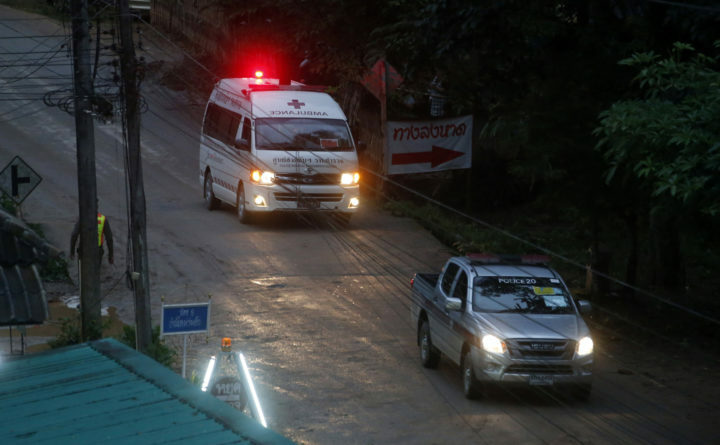 One of two ambulances leave the cave in northern Thailand hours after operation began to rescue the trapped youth soccer players and their coach, in Mae Sai, Chiang Rai province, in northern Thailand, Sunday, July 8, 2018. Eight boys and the coach remained inside the Tham Luang Nang Non cave complex as authorities paused the international effort until Monday to replenish air tanks along the treacherous exit route. He told reporters that four boys were brought out and taken to the hospital in the town of Chiang Rai, the provincial capital, for evaluation, and the next phase of the operation would resume after about 10 to 20 hours. Narongsak had dubbed Sunday to be “D-day” as the complicated effort was launched in the morning. But Narongsak said earlier that mild weather and falling water levels in recent days had created optimal conditions for an underwater evacuation. Those conditions won’t last if the rain resumes, he said. Authorities have said the monsoons could cause water to rise in the cave. That along with dwindling oxygen levels added to the urgency of getting the team out. Earlier efforts to pump water out of the cave have been set back by heavy downpours. The ordeal has riveted Thailand and captured the world’s attention. The search-and-rescue operation has involved dozens of international experts and rescuers, including a U.S. military team. Elon Musk’s Space X rocket company plans to send a “tiny kid-sized submarine” in case it’s needed. A spokesman for Musk’s Boring Co. tunneling unit, which has four engineers at the cave, said in an email Sunday that Thai officials had requested the device and that divers have determined it could potentially help the children through narrow, flooded cave passageways.